The primary design focus of the HealthEast Clinic & Specialty Center in Maplewood, Minn., was a balance between quality, beauty, environment, convenience and functionality. The Davis development team implemented many special features in the clinic while keeping tenant leases at market rates. Maplewood and Minneapolis, Minn., Oct. 11, 2018 – The award-winning, 148,000 square foot Health East Clinic & Specialty Center in Maplewood, Minn., developed by Minneapolis-based Davis, has won another honor – an Award of Excellence from NAIOP Minnesota, the local chapter of the national commercial real estate development association. The award in the Medical Office Building category was presented to Davis Principal Mark Davis at NAIOP Minnesota’s 35th annual awards celebration Sept. 27 at the Nicollet Island Pavilion in Minneapolis. 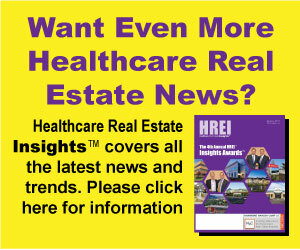 The Health East Clinic also received top honors in last year’s HREI Insights Awards, an annual awards program sponsored by the national healthcare real estate magazine Healthcare Real Estate Insights. The project was named “Best New Medical Office Building” in the 100,000 square feet or more category. Mr. Davis said the biggest challenge of the Health East project was that the development team had to expand the building twice after construction began – nearly doubling its size – to meet increased tenant demand, yet they were still able to deliver the upsized facility within 30 days of the original target date. To accomplish this, the team needed to negotiate the city approval process two additional times but successfully delivered the 148,000 sq. ft. building that met its original long-term financial parameters. This project also added numerous jobs and achieved 90 percent lease-up by building completion. The architect for the project was bdh+young of Edina, Minn., and Timco Construction Inc. of Plymouth, Minn., was the general contractor. NAIOP, the Commercial Real Estate Development Association, is the leading organization for developers, owners and investors of office, industrial, retail and mixed-use real estate. Founded in 1967, NAIOP comprises 19,000-plus members and provides strong advocacy, education and business opportunities through a powerful North American network.